A slight cheat here. The model is actually 1:100. 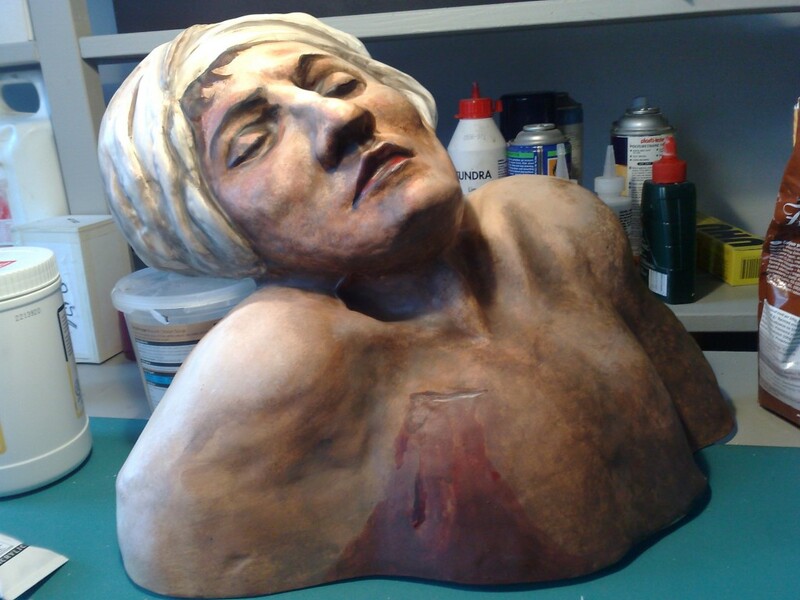 Emma was assisting David and having found out that I sculpted asked me to advise him on tools and materials to make the sculpture based on the painting by Jacques-Louis David: The Death of Marat. After a trip to Tirantis sculpture merchants, we both decided that it would be good if we went to his studio and did it for him. Of course David wanted it in three quarter relief, an added challenge. Some marvellous paintwork by Emma, an enlightening and interesting introduction to modern jazz, wonderful repartee, and a very late night later, we had a sculpture. It was great working with David again. I had assisted him as a student on Elizabeth the Second at the Gate Theatre in 1992 when Stephen Daldry was nearing the end of his stint as Artistic Director. A great experience. 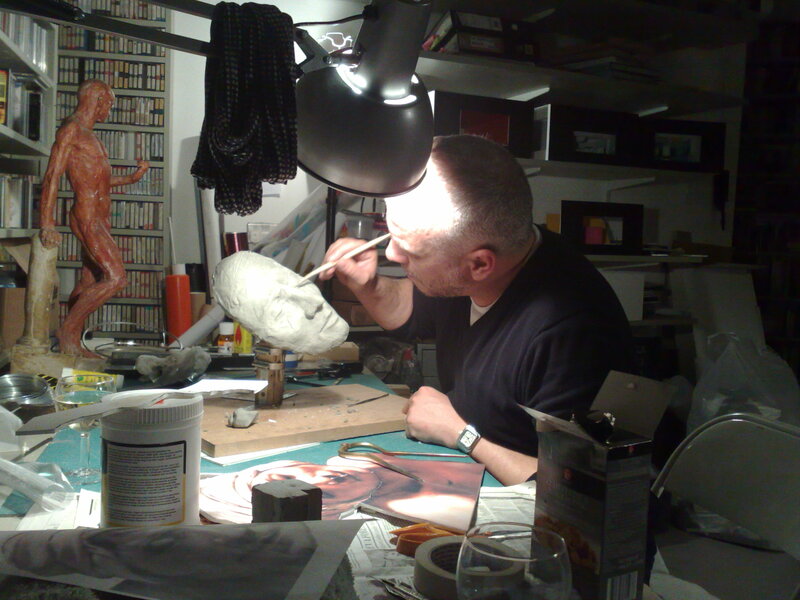 It is sculpted in Plastilene, vacuum formed and then primed and painted. This is a type of modelling wax not too unlike plasticine. It is thinned with white spirit or lighter fluid, but unlike ceramic clay, it does not need wetting down and wrapping. You can also melt it down and reuse it over and over again. You can pour it into moulds and make secondary models in wax to work on. Very useful for larger works or for experimenting with form and structure. It also comes in several hardnesses; very handy in the winter in a cold workshop, or the summer in a hot studio. I would recommend buying the french version in tubes as it has a much smoother quality to it. This is particularly important when detail is being smoothed down or blended with thinner. We’ll do a future blog on this material and an introduction to some tooling and toolmaking techniques.